In September, 2005, I decided to replace the 1940 Playball tribute card with a contemporary issue and chose the W514 strip card. I found a SGC 40 example via eBay and had it for several years. 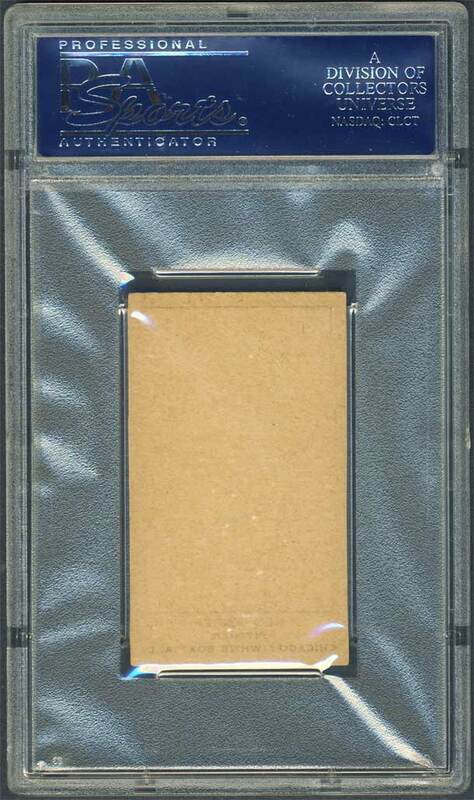 Then, in the August, 2010 Legendary Auction someone decided to part with their W514 Complete Set - #1 on the PSA Registry. At the time it was the finest set ever to be offered in public auction. 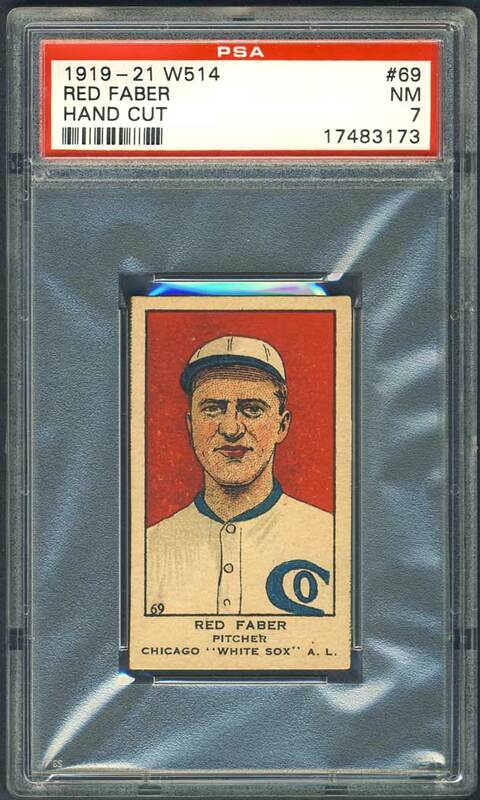 This PSA 7 of Red Faber was included. I guess the winning bidder decided to break up the set and sell the cards off individually, because a month later I was fortunate to pick this one up on eBay. And, I'm glad I didn't have to pick up the whole set to do so. The assembly was sold for $23,700 — with a 7.13 cumulative GPA. According to PSA's census reporting, nearly every single example was the only specimen at the assigned grade level, including such names as Joe Jackson, Babe Ruth, Ty Cobb, Tris Speaker, Christy Mathewson, and a plethora of other Hall of Famers. The grading composite included: PSA MINT 9: 8 cards w/#'s 9, 27, 41 Griffith, 52 McGraw, 74, 93, 98 and 102 Speaker (Cert #17098733); PSA NM-MT+ 8.5: 7 cards w/#'s 14, 42, 49, 57, 99, 106 Jennings/Tigers (Cert #17098729) and 105 Risberg; PSA NM-MT 8: 38 cards w/#'s 4, 5, 6, 10, 13, 15 Jackson (Cert #17098732), 18, 19, 22 Carey, 26, 29, 33, 34 Huggins, 35 Williams, 36, 39, 43 Cobb (Cert #17098724), 44, 45, 46, 47/Indians, 48, 53, 54, 56 Hornsby (Cert #17098745), 67, 73, 75 Baker, 81, 83, 95 Crawford, 96, 103, 104, 109, 114, 115 and 118; PSA NM+ 7.5: 2 cards w/#'s 51 and 88; PSA NM 7: 33 cards w/#'s 1, 2 Ruth (Cert #17098734), 12, 16, 17, 23, 24, 25 Collins, 28, 37, 55, 59, 62 Lajoie, 63, 64 Hooper, 68, 69 Faber, 72 Mathewson, 82 Cicotte, 84, 85 Roush, 91 Weaver, 92, 97, 100, 101 Sisler, 107, 108, 110 Wheat, 112, 113 Stengel, 116 and 117; PSA EX-MT 6: 19 cards w/#'s 20, 21 Maranville/Braves, 30, 31 Gandil, 38, 40 Bancroft/Quakers, 58, 60 Schalk, 61, 65 Alexander, 66, 71, 76, 77, 78, 79 Rice, 86, 89 and 94 Johnson; PSA EX+ 5.5: 3 cards w/#'s 3 Felsch, 8 and 11; PSA EX 5: 5 cards w/#'s 7, 32, 70, 87 and 90; PSA VG-EX+ 4.5: 1 card, #50; PSA VG-EX 4: 3 cards w/#'s 80, 111 and 120; PSA GD 2: 1 card, #119. Description: Consisting of 120 cards, the W514 set is the largest of the various "strip card" issues of its era. Issued between 1919-1921, it is also one of the earliest and most widely collected. The 1-3/8" X 2-1/2" cards feature color drawings of the players and display the card number in the lower-left corner. 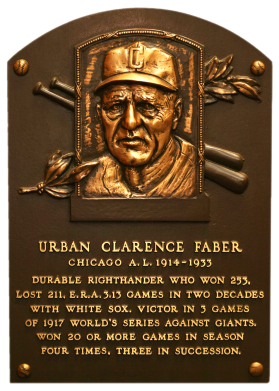 Chock-full of Hall of Famers and the stars of the day, the set holds special interest for baseball historians because it includes seven of the eight Chicago "Black Sox" (minus Fred McMullin) who were banned from baseball for their alleged role in throwing the 1919 World Series. 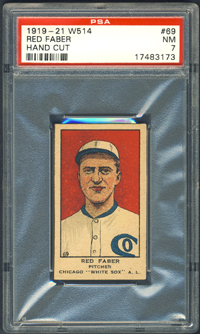 The most famous of them, "Shoeless" Joe Jackson, makes his only strip card appearance in this classic set.